Every year FIFA chooses the best ten goals from the thousands scored around the world in amateur and professional matches. This year's final group contains a shaky-cam video of a goal scored by an amateur Irish female player in front of a crowd of ... dozens. 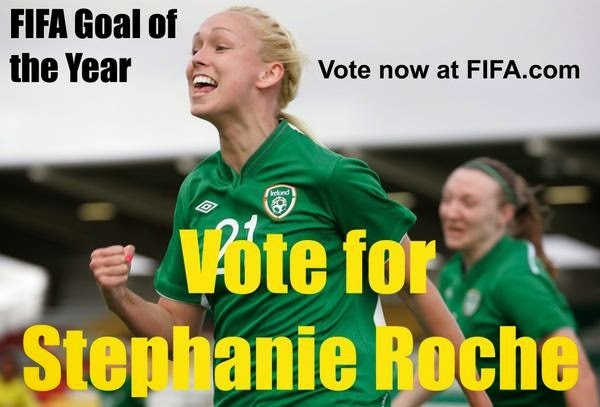 Stephanie Roche plays with Peamount United, and she scored this cracker against Wexford Youths in October last year. Have a look and please vote here on the FIFA page if you like what you see - one giant step for women in sport to see her judged on a par with male players. And even more exciting as this was an amateur match and Roche pulled off a goal to equal players paid millions for their work.